This isn’t a direct quote but it’s the type of thing I hear often, particularly in the world of health. A certain population is perceived as healthy (or simply not sick and overweight), therefore what they do is “healthy” and if you mimic or follow their diet you will be healthy. This may be true but I can’t help but think that these healthy populations may play by different rules. Take the Okinowans. How many of them grew up on a standard American diet? None. They have lived a traditional lifestyle from birth. This doesn’t mean what they do is unhealthy it just makes me wonder if what they eat works only if you’ve never been overweight, under slept, uber stressed, disconnected and technologically overstimulated. Is the diet, as great as it may be, simply population specific? Are the rules different for people who grow up unhealthy? 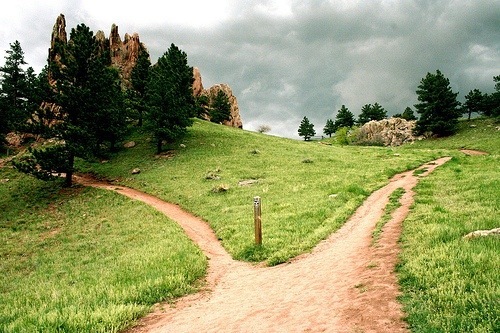 In essence, does being in a different place mean a different path is necessary? A person who grew up unhealthy may not be able to just follow the model of someone who’s never been unhealthy and expect to end up in the same place. Can these two paths even reach the same place? When the journey has been different and the starting points are miles apart, does it make sense to say that the paths should be the same? If we look at three different people in the middle of a journey and one is standing before a flat grassy plain with a few rolling hills, another is before the Fire Swamp and another is at the bottom of the Cliffs of Insanity, can we say their path to the castle will be the same? Two of the three have massively challenging paths ahead of them while one has things easy. Wouldn’t we expect different planning, psychology, behaviors, obstacles and time to elapse along the rest of their journey? Of course. So shouldn’t we use the same logic when we look at people’s paths to health? Other people’s paths can be nice examples for us but we always have to keep in mind where we are and where we’ve been. Our path will start from a different place and need a different route than nearly everyone else we know. We may be starting from similar places but no two people walk the same path or end at the same destination. General directions are helpful for populations but the more specific the path the more likely it’s only appropriate for a select few. Thanks for thinking, have a great journey! P.S. When observing someone else’s journey keep in mind the more specific and detailed the path they have traveled the less likely it’s suitable for a large number of people and for people who don’t have the same history.